The Cute Little Bainbridge Family: No more Babies in June!! I would just like to start off by saying that William was my last June baby, and 12 days early he weighed 11 pounds 2 ounces. My December/January babies are little guys in the 9 1/2 pound range. So . . . I had my 36 week OB appointment today. And because I have noticed a huge decrease in fetal movement the last three days, they did an unplanned ultrasound. Everything looks good. He is taking lots of "practice breaths". It was neat to watch the lungs inflate and deflate. His heart rate is good. And best of all, he is moving, I am just not feeling it. 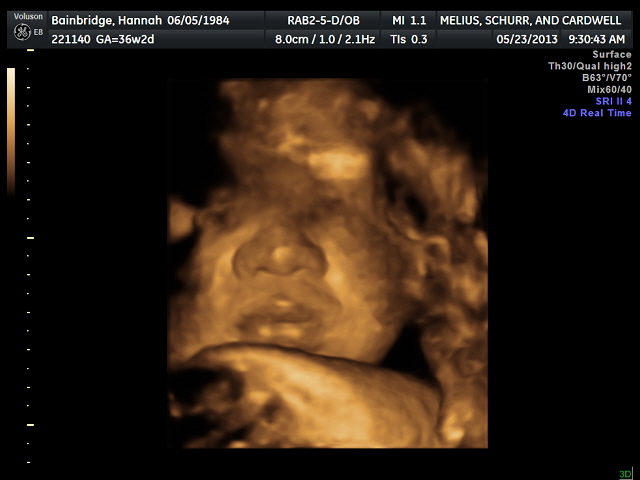 And while my OB didn't ask her to, the ultrasound tech did a growth scan, and measured our little guy. Turns out, he isn't so little. As of today, he weighs 9 pounds 14 ounces. (That's give or take a pound.) My doctors reply: "Well, we know she can deliver large babies, so we aren't really concerned with the size." He says that because HE isn't the one carrying a 10 pound baby!! Or the one who has to push him out!! Sadly, we didn't get any great pictures. His face was smushed up against my uterine wall, and he just wouldn't move it. And as a quick update: I got a call from the doctor today. My blood platelets have dropped significantly since the last test that they did. They had to repeat the test because they were a little low to begin with. Anyway the normal count is 150 thousand. The first test I was at 144,000. Just under normal, but they wanted to recheck it just in case it dropped. Well my count as of yesterday was 105,000. If I drop below 100,00 I can't have an epidural. I'll admit, I am a little discouraged by this thought. HANNAH!! I read the title to your post and thought, "She had her baby!! Wooo! A May baby!" And then I actually read the post and slowly like a tiny gas leak my excitement diminished. Okay maybe not diminished because I'm still very excited to meet this "little" guy... but you know what I mean haha.